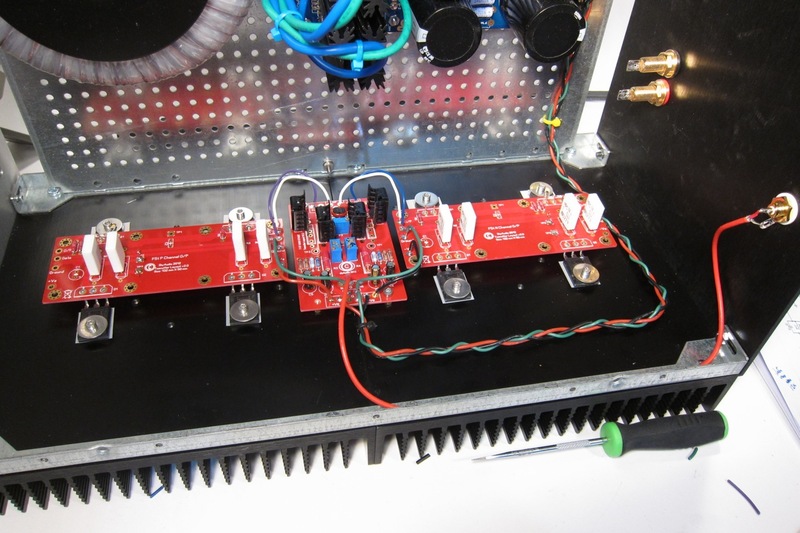 You can build any version of the amp from this article, or have multiple outputs, use the Cascode or not, etc… But when referencing the silkscreen to the schematic, remember to use this one. Please have this printed out in front of you when you are stuffing the PCB. Also, in my opinion, C3 and C4, labeled here as ‘OPT’, are required for stability from destructive oscillation. This is a very high bandwidth design and those caps help protect it from ultrasonic HF oscillation. Use 1000pF. Also, if oscillation is a problem for your build, increase the value of the gate resistors (R13 -16 and similar) any value from 47.5R to 680R will work and sound fine, the higher the value the more damping occurs. A look at the new PCB. The biggest changes are the increase in size of the PCB, in order to accommodate holes that will mount to the Universal Mounting Spec. Also there are multiple solder pads at each wire connection point, making it much easier to configure this to any of the F5T variants. If using single-ended (RCA) inputs remember to add this link at the labeled spot. Please remember that this build is showing the cascode circuit being used. It is not strictly necessary for 32V rails, but is required if you choose to use higher voltages. If building a v2, I would suggest not cascoding, simpler is better. In this build the packages in R8 and R9 are not transistors but high wattage Caddock resistors, I used them as I had them on hand. Most builds will use 3W axial lead resistors in the R7-10 positions. Also note that because the cascode circuit is used, there are capacitors in the C5, C6 positions. As well as all the associated resistors, and of course the transistors. This photo shows the Front-End board (hereafter referred to as “FE board” or “FE”) stuffed in the manner to build a v3 or v2 with cascode. 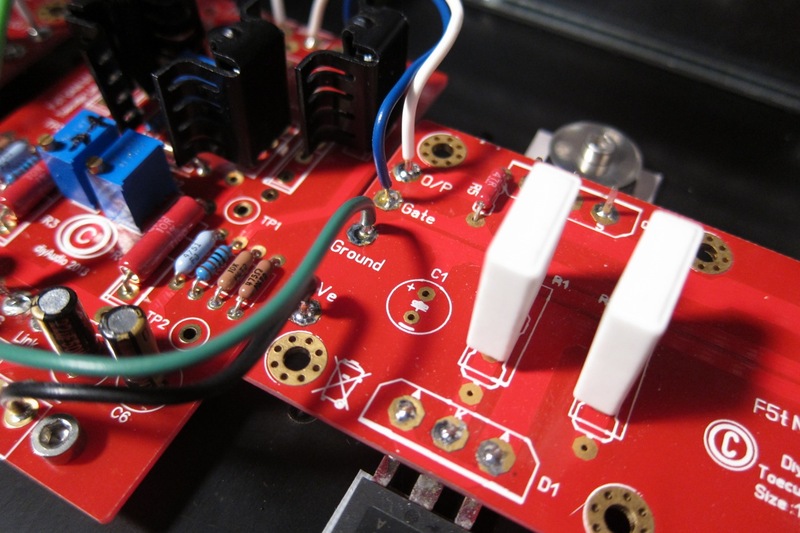 The feedback resistors and cascode transistors have clip-on heatsinks, and the rest of the board is stuffed. The Q1.1 and Q2.1 position are left empty, they are there if you are going to make a huge F5T with more than 4 pair of output transistors, so you can parallel the Jfets and have more driver current. Note regarding P3 - set to it’s center value before stuffing. Equal resistance from leg 1 to 2, and from leg 2 to 3. Connect C to E for non-cascode. Watch the labeling, they are mirror image left to right. 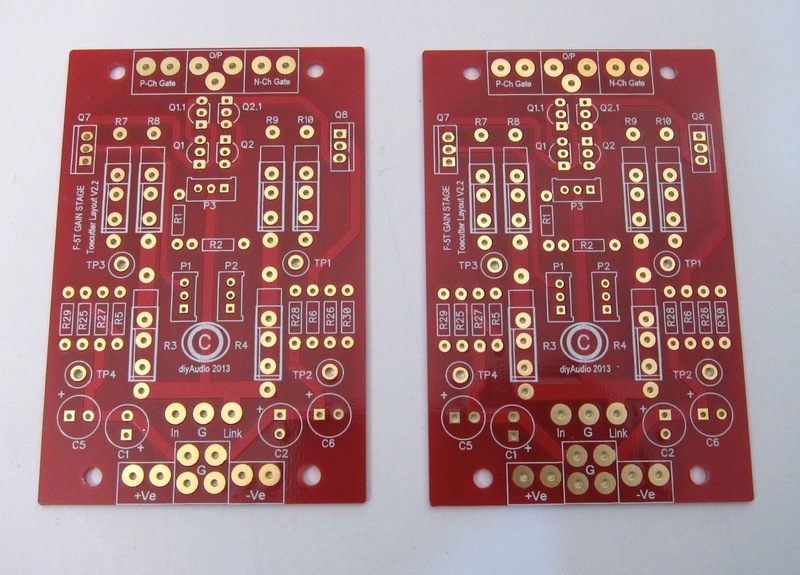 The output boards are very straightforward, the thing to remember is to have the N channel on the right, which will make the hookups rational as well as placing the thermistor on the outside. Also take a few clipped-off resistor leads and make some terminals for the test points (TP1, 2) if you have a voltmeter with clippy probes. Output boards mount as shown. Some people will suggest that the Mosfets should be lower than the diodes for most efficient heatsink usage. There may be a difference, I can’t tell much, I’ve tried it both ways. The photos with the v3 boards have the fets low. The output boards are shown here with slightly different resistors.Also note the standoffs in the center for mounting the front end PCB. The FE mounts in the center, and it’s easier if you attach some of the wires before installation. Connections to the output boards. The power from the PSU is connected to the FE board. It is routed as shown for the purpose of clarity and illustration. I strongly suggest you make these connections as short as comfortable. This shows the final connections, the speaker outputs, black and red down the center of the photo. A stereo F-5T v2 requires a bipolar power supply of (+/- 32V). This will require an 24V+24V (or 48V Center Tapped) transformer from 600-800VA, and PSU capacitance of 80,000uF per rail or more. The F-5T v3 will require two of the above PSU. (One for each monoblock.) If you have the heatsink and proper voltage capacitors you may use even more voltage for more power, see the original article for more information. 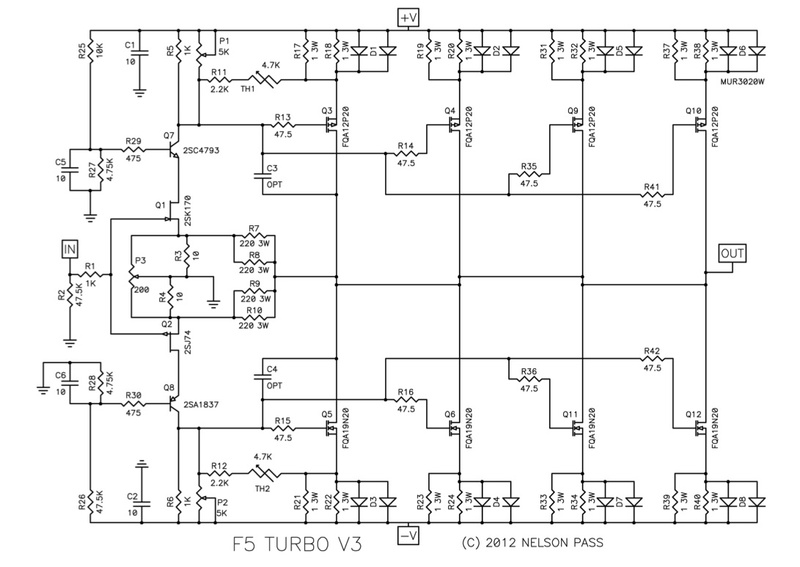 Although not the exact PSU as shown in the Nelson Pass article, the diyAudio PSUv3 circuit board can be used to make a suitable power supply for the F5Turbo. 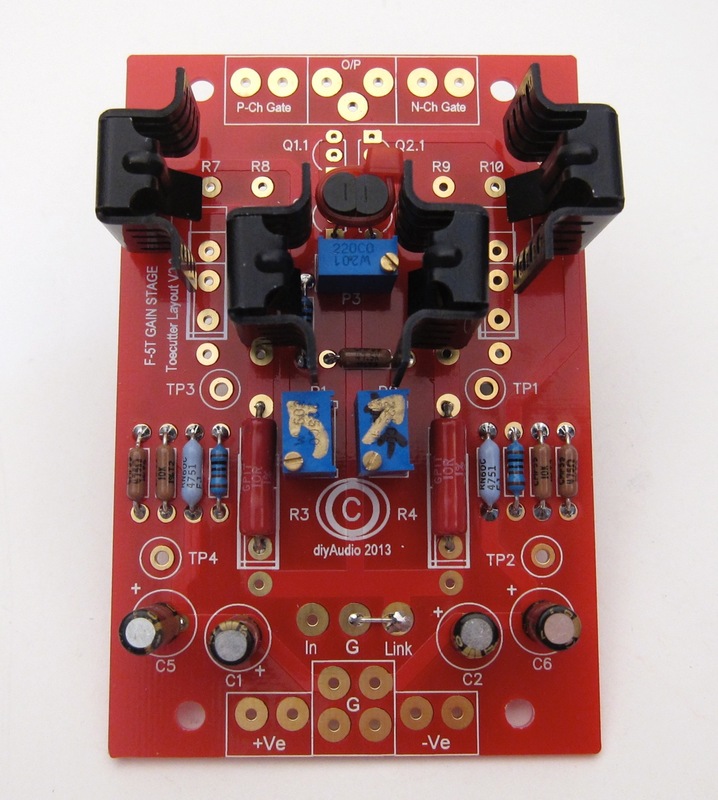 Using the PSUv3 board allows an easy addition of dual diode bridges, which will help keep the transformer mechanical noise to a minimum, and other benefits such as LEDs on each rail, room for (8) capacitors of up to 35mm diameter, the ability to use many different styles of connectors on the board itself, and not to mention the convenience of having everything on one PCB. 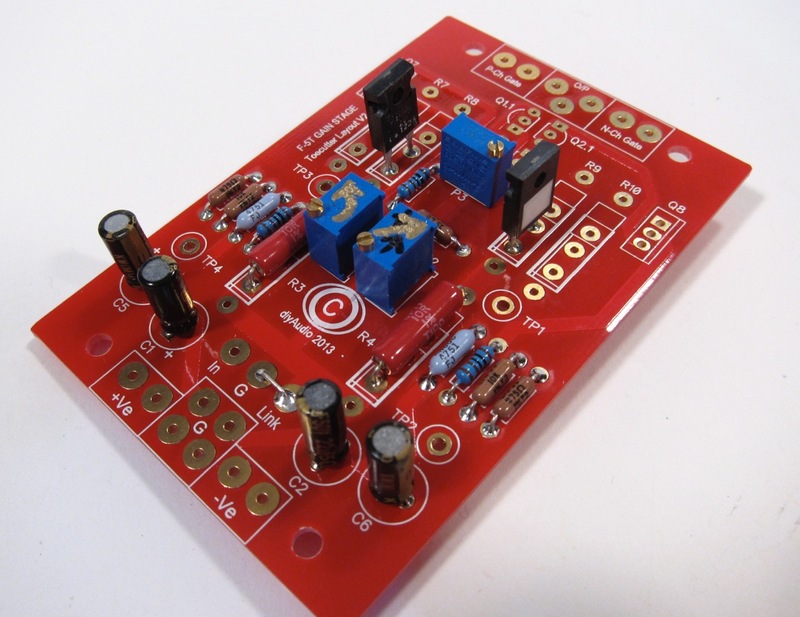 The diyAudio universal PSU v3 was made with the requirements of this very amp when it was designed. With the PSU board stuffed and installed. Remember to test the PSU for proper voltages (which, with no load, will read a little high) before connecting any of the amplifier circuit. 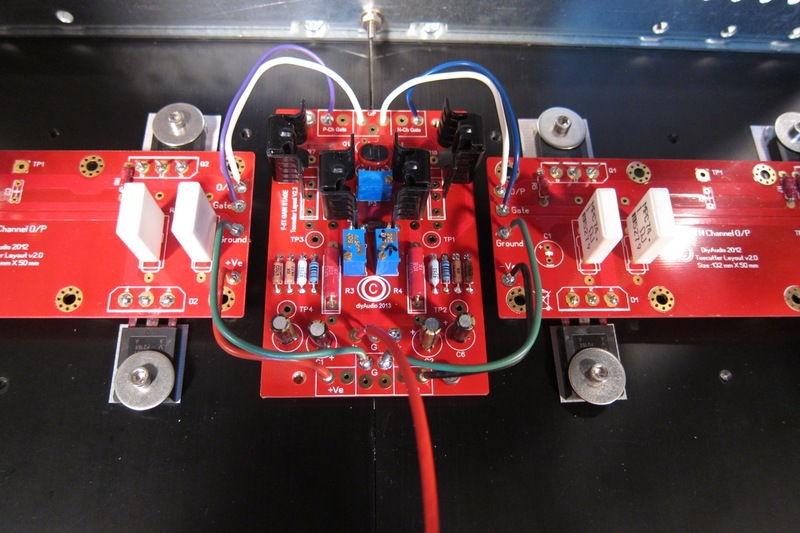 Meter set to DC volts, black probe on GND, with red probe read +32V on V+ and -32V on V- . 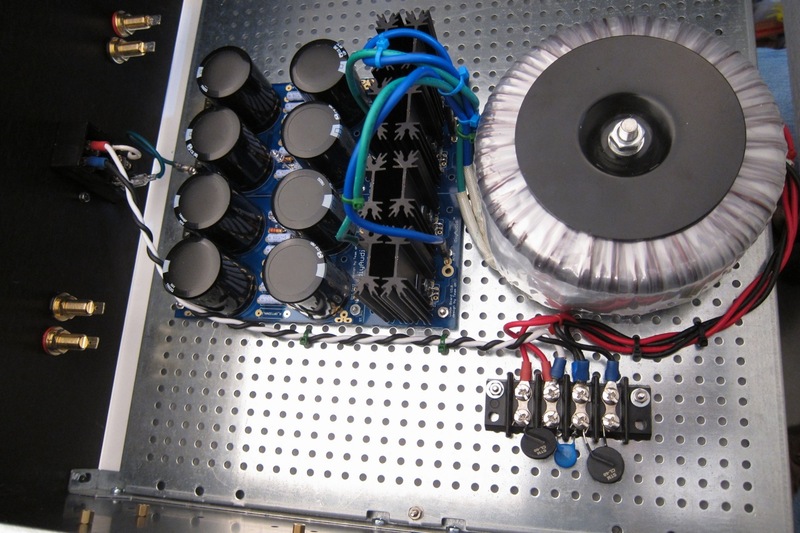 This is a high-wattage Class-A amplifier. It has lots of excess heat that needs to be dealt with. The 5U Chassis is of suitable size and dissipation for a Stereo v2 or a monoblock v3. The 5U and 4U Deluxe chassis from the DIY audio store are basically identical except for size and that the 5U heatsinks are 2 pieces per side. This is easiest with three DMM. Shorting the input jacks is helpful, although not strictly necessary. With voltmeter across PSU output ( best between + and - of PSU) observe max voltage of PSU - it never hurts to make sure it’s doing what you expect. Place voltmeters across TP of output board, one on N-channel, one on P channel. IF you don’t have a Variac, you must build a lightbulb mains lead. What's important - Iq (measured as the voltage across source resistors; the Mosfet bias) must be very low , offset is irrelevant in this moment . Now turn one pot one turn ( assuming that you have multiturn pots) then turn other pot one turn. Continue, one turn at a time on each pot until something happens. 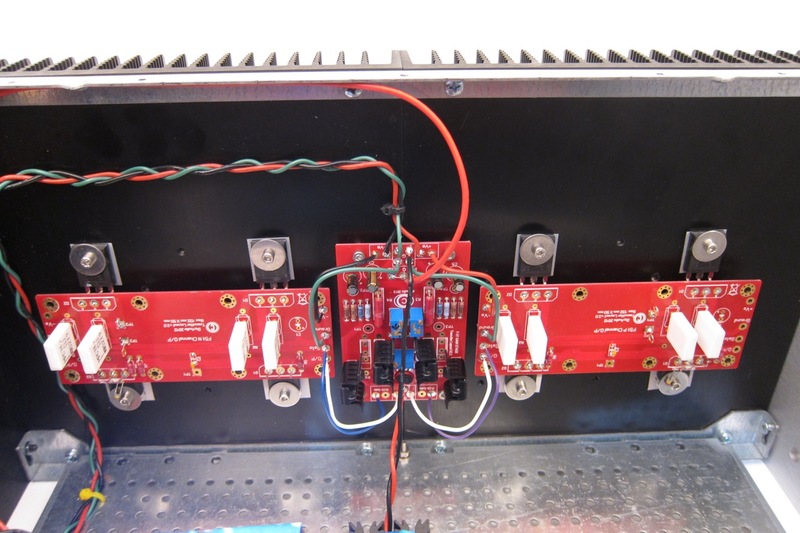 Observe voltage across resistors and output DC offset. Now you are probably in range when you can see which pot is pulling offset in right direction - to 0 . 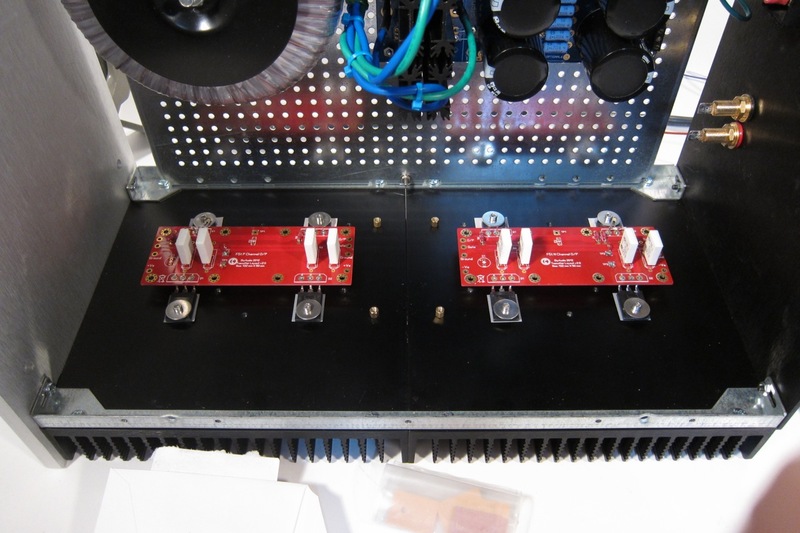 It will feel like one of the pots is controlling the bias on both sides, and the other is controlling the DC offset. It’s best to increase the bias a bit, and then zero the offset. As you zero the offset you will decrease some of the bias, so it will be two steps forward and one step back. That action is normal. Proceed iteratively with pots , while you set - say - 75% of desired bias, with zero offset. Put lid on , let it cook. If all is OK - move voltmeters for Bias and offset to other channel and repeat procedure. 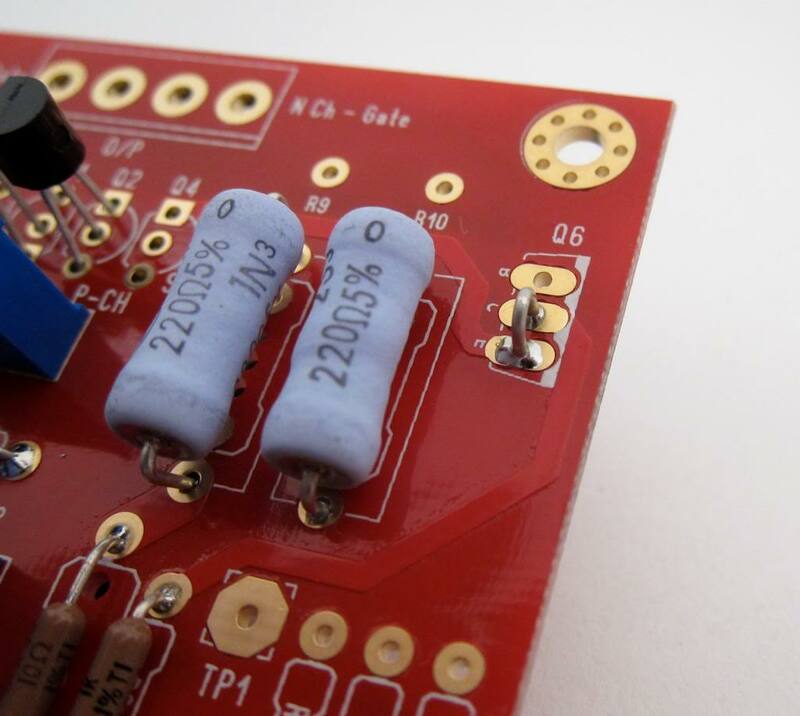 BEFORE installing and soldering P3 it’s best to adjust the pot so you have equal resistance from pin 1-2 and pin 2-3. Assuming well matched Jfets the neutral position is going to sound really nice, with 2nd harmonic dominant at the 1W level. 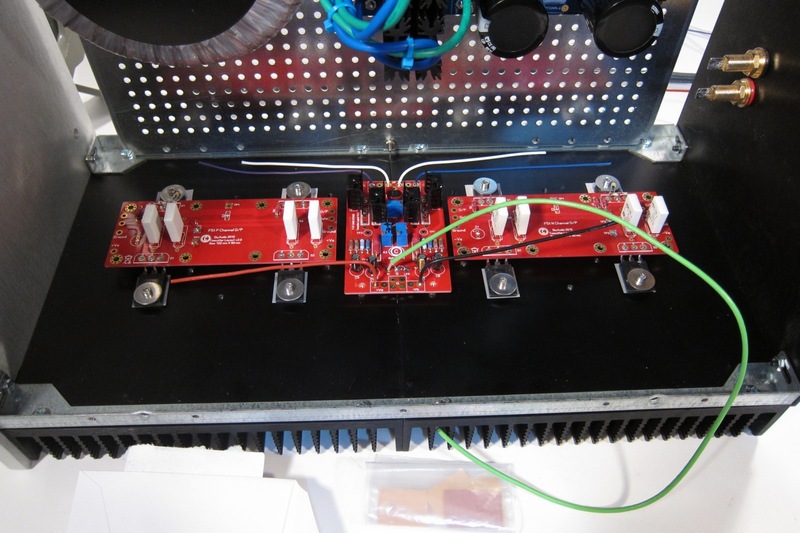 IF you have access to a distortion analyzer, or a high-resolution FFT (or both…) give the amp a 1K test sine wave that outputs 1W into your load resistor. Then adjust P3 as necessary for the harmonics you prefer. If you adjust for minimum THD, you will likely have nulled out most of the 2nd harmonic and made it 3rd dominant, which in my opinion makes it very fast and clean, at the expense of soul. YMMV. If the bulb ever turn on and stays bright, you probably have a short. As you increase the bias of the amp the bulb will glow brighter, and this is linear with the bias amount. A fully biased amp can get the bulb to glow very bright. You cannot set full bias with the bulb in place - as it increases the bulb will glow more, limiting the voltage to the amp and all the readings will be wrong compared to when the bulb lead is out. You can, however, set the initial bias with the bulb in place. Start the procedure, turn the pots until something happens, and set, at maximum, 0.1V across the source resistors and zero offset. Getting the pots started this way is a good idea. Remember, this is with a reduced voltage, and the pots will make the circuit draw MUCH more bias when the normal mains lead in used. Expect to measure 0.2V or more with a normal cord. Continue biasing in small steps, always trying to keep the offset near zero. Last edited by 6L6; 3rd June 2018 at 08:08 PM. We the proletariat demand this as a sticky!! The resistors for the voltage dividers to the bases of the cascode transistors are in error on the schematic, as shown, in that they differ on each rail. I found all 4.7k or all 10k work fine with pre-load 32 volt rails (or close to 32V). 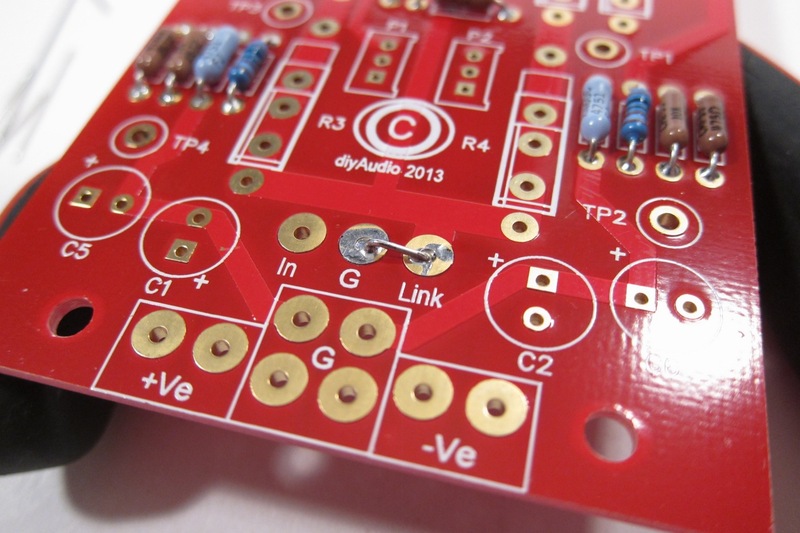 R25:R27 seem to be in the correct ratio and give ~9V Vds on the upper jFET. R26:R28 do seem odd. They end up giving <3Vds on the lower jFET. Equal values (1:1 ratio) will give >15Vds on the jFETs. Last edited by AndrewT; 14th April 2014 at 09:46 AM. What power output can I get into a 6 ohm speaker with a standard v2 build? depends on the supply rail voltage. where Vk ~ Vsupply minus 3 to 5V of drop through the amplifier. [35-5]^2 / 6 / 2 ~ 75W into 6ohms. But that could be in ClassA or ClassAB depending on the value you set for the output bias current.